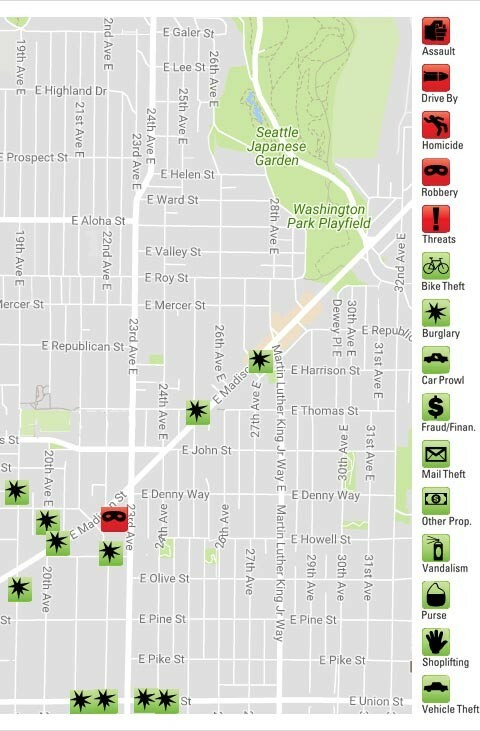 Eleven burglaries in were reported in Madison Valley during February, which is almost double the monthly average. A little over half of them were residential burglaries, but only one of them involved a single-family dwelling. As the number of apartment buildings and condos in Madison Valley continues to grow, the proportion of burglaries that occur in single-family dwellings will decline. 1. On Feb. 2 at 10 PM there was a forced entry burglary at a business on Madison near 27th Ave. E., but the police have not posted a detailed description of the incident. 2. Sometime during the daylight hours of Feb. 15 a burglar broke into an apartment on 20th Ave near Denny and stole personal items worth approximately $700 and credit cards that were subsequently used for purchases worth $600. The police were unable to find fingerprints in the apartment. 3. On Feb 16 there was a burglary that did not involve forced entry at a nonresidential building on 22nd Ave. near Olive, but the police have not released a description. 4. On Feb. 22 there was a forced entry burglary at a residence on 19th Ave. E near Denny, but the police have not released a description. 5. Just after 2 AM on Feb. 23 two burglars broke into the lobby of an apartment building on Madison near E. 20th Ave. After spending time in a bathroom off the lobby, the burglars, described as a male and a female in their 20s, broke into a storage closet and removed a package. The female burglar also attempted to open two safes in the room and then found and removed a device that makes keys for both the building and for individual units in the building. At around 3 AM the burglars left the building, heading west toward a north-south alley. Security cameras recorded the burglars’ activities and captured very good images of the female burglar. Building managers did not recognize the burglars as being residents of the building. 6. On Feb. 23 at about 11:20 PM a burglar gained access to an apartment building near 22nd and E. Union by entering just after a resident. Once inside, he broke into several secure areas of the building but the police report mentions no missing items beyond approximately $20 in cash. Video footage of the event clearly shows the burglar’s face. 7. Police were called to a business on E. Union near 22nd on Feb. 24 to investigate a burglary that occurred sometime during the previous night. The burglar apparently entered through the rear door of the business, which opens onto an area shared with an apartment complex at that location. The burglar apparently only took loose change from a cash register. There is a possibility that a security camera owned by the apartment complex may have recorded the burglar’s entry into the business. 8. Sometime between 6 PM and midnight on Feb 23 someone forcibly opened the several mailboxes at a condominium building near 25th and Madison. There is no security camera in the area, and police did not search for fingerprints because the area is heavily used. The police report specifies only a few minor items that were known to have been taken by the time when the police arrived. 9. On Feb. 26 police were called to a building on 19th near Madison that houses a non-profit organization that helps homeless youth. When they arrived, employees at the organization reported that sometime during the previous weekend a burglar had entered their offices and left incoherent notes on a whiteboard and on various pieces of paper and had also forced open several metal cabinets. Aside from the damage to the organization’s equipment, however, nothing appeared to have been taken by the burglar. 10. Sometime between Feb. 22 and Feb. 27 someone broke into a bicycle storage area in an apartment building near 24th and E. Union and took equipment from a bicycle being kept there. 11. During the night of Feb. 26–27 someone entered the bicycle storage area of a building near 24th and E. Union and stole a woman’s bike worth approximately $500. Although this is not stated in the police report, it appears that this is the same building as that in the previous burglary incident. There was video footage of this incident, but it does not show the burglar’s face. Also, during February there was another shoplifting/robbery incident at the Safeway store on Madison. On Feb. 9 at around 3 PM an employee at the Safeway store confronted a woman who had bypassed the checkout area with approximately $200 worth of items in a shopping cart. When the woman threatened him with a knife, the employee backed off and the store called the police. The woman is known as a frequent shoplifter at the store, and the incident was recorded by the store’s security cameras. Police conducted an area search, and although they did not find the woman, near 24th and Denny they found the empty shopping cart that the woman used. 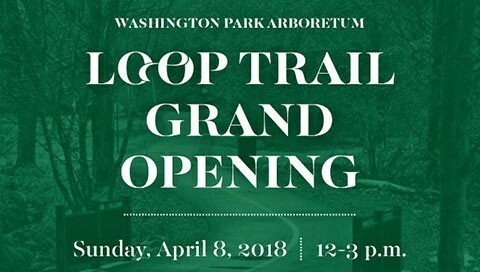 An afternoon of public festivities will celebrate the opening of the new Loop Trail in Washington Park Arboretum on April 8 from noon to 3. There will be a ribbon-cutting, live music, free snacks, food trucks, and fun activities all along the 2-mile loop. A performance by the Husky Marching Band Drumline. Educational activities for kids hosted by UW Botanic Gardens, plus the opportunity to learn about field trips, camps, and more! Free snacks, artists-at-work, and more! Parking at the Arboretum will be very limited during the Loop Trail event. Please consider coming by bike, foot, or public transportation. The City Council’s Planning, Land Use and Zoning (PLUZ) Committee will hold a public hearing to take comments on the proposed design review district and board, and neighborhood design guidelines for the Central Area neighborhood. For more information on the time of the hearing, please check the Committee agenda a few days prior to the meeting at http://www.seattle.gov/council/committees. For those unable to attend the public hearing, written comments may be sent to: rob.johnson@seattle.gov and should be received by April 3, 2018, at 5:00 p.m. The City of Seattle is proposing to amend the Land Use Code to establish a new 2030 Challenge Pilot to promote the construction and operation of buildings that meet the highest green standards and promote environmental quality, and revise the living building pilot program. Featuring Irish-Style Brews, including Boundary Bay Irish Red, Iron Horse Quilter’s Irish Death, Diamond Knot Slane’s Irish Red, Lowercase Dry Irish Stout and Double Mountain Black Irish Stout (on nitro). We’ve got the cure for whatever ‘ales’ you! The BottleNeck Lounge is an over 21 years of age establishment. Two Doors Down is family-friendly and includes all ages.